Extreme versions of the attachment types can be diagnosed in adults as disorders. Many theorists believe that an entrenched avoidant attachment is at the core of the narcissistic personality disorder. Narcissism to varying degrees is a normal personality trait—we could substitute “self-centered” for the term and be correct. Psychologists think youthful narcissism is a part of typical emotional development—the stage where you say “Mine!” when asked about any toy. Normal children grow out of this as they experience the evaluations of others, and create a more realistic view of themselves and others as they grow up. Many high-achieving adults score high on a narcissism test, being preoccupied with how they look to the world and working hard to increase the admiration received from others. In many professions this can be a useful and even necessary trait. But the most effective of them also understand and value the feelings of others, and thus are more successfully manipulative in getting them to do their bidding. When we talk about dysfunctional narcissism, we are talking about adults whose self-centeredness and use of others to satisfy a deep need to be the center of attention has gone beyond functional to become abusive. The harm they do to their partners comes from manipulation, verbal and physical abuse, and abandonment—because the attention of a partner is only valued when it is shiny and new, and the increasing distress of a narcissist’s partner is met with hostility instead of efforts to reassure. The narcissist has little empathy or sympathy for the feelings of others since he or she is only concerned about getting the attention needed to cover up the hollowness of their low self-esteem. How does the narcissist get that way? As a defense to caregiving that devalues the child’s true self, often provided by a narcissistic caregiver who needs the child to be “perfect” and “special” because that is how the caregiver views herself. Babies crave having their performance validated, they need to be seen and loved for who they truly are, and they need to be given an ongoing sense of belonging, of being a valued fellow being in the family. If a mother fails consistently to attune to her baby in this way and to respond to his complex emotional needs, the young child, feeling unknown and unappreciated, is unable to know or appreciate himself. He shrinks back into a sense of helplessness, smallness, defectiveness, and shame, which he may then defend against by clinging to his infantile grandiosity, a grandiosity one or both of his parents may promote.… Outwardly self-important, prone to pomposity, self-adoration, and an annoying attitude of entitlement, he is haunted by a fragile self-esteem. His friends complain he’s only interested in talking about himself, his boss that he takes frustrations too personally, his neighbors that he’s pushy and conceited. Narcissists are users: they exploit others ruthlessly for their own needs, and as a result tend to have few or no long-term relationships, with shallow and utilitarian relationships predominant. Because of their underlying lack of self-esteem and dependence on others, they are deeply hurt or angered by criticism or a lack of the attention they feel they deserve, imagining slights in the most minor incidents. Not having a realistic understanding of the emotional states of others, constant reinforcement of their egos (called narcissistic supply) is required for them to remain stable. If a relationship partner is critical or fails to provide the needed supply of ego-boosting attention, the narcissist will go into a rage and devalue the partner, with physical or emotional abuse being a common control technique. 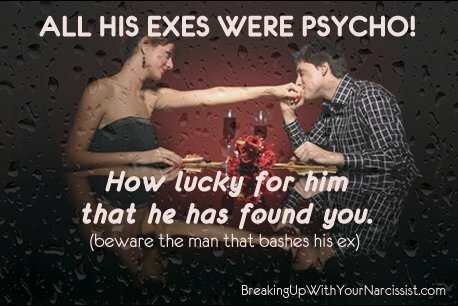 Tearing down others makes the narcissist feel better about themselves, and one key to recognizing a narcissist quickly is a self-reported history of being involved almost entirely with unreliable, crazy, or otherwise defective partners. No relationship breakdown is ever the narcissist’s fault! Narcissists believe they are special and better than other people, and if the universe fails to confirm their belief as it becomes clear in later life that their grandiose expectations will remain unsatisfied, psychic collapse and depression can result. Narcissists rarely recognize any problem with their condition until depression and loss have made them desperate. A narcissist tends to talk about himself in glowing terms and denigrate or diminish others in his life; if your date mentions several previous partners and has something bad to say about all of them, he’s probably a narcissist, because no relationship issue is ever his fault. Putting down others to feel superior is their thing. The narcissist may have the outward trappings of success, but of all the types in this book, the narcissist is the most likely to be deeply in debt to keep up appearances. The car is leased, the teeth are capped, the successes they talk about are exaggerations. If no one you’ve met knows him well and you can’t confirm his stories, beware. In conversation, if he seems unwilling to listen to you talking about your life and your feelings, beware. No matter how interesting he seems to be, if he doesn’t show signs of caring about how you feel, don’t get sucked in. Ask yourself why this person wants you around if they don’t care to know your history, your feelings, your friends, and your family—is it because you make a great fashion accessory? Does he look more successful when you’re with him? Any hint of controlling behavior—extreme jealousy, paranoid accusations, the sense that you have to justify yourself constantly—is a red flag. Also note as signs: overreacting to mild criticism, rages and tantrums when questioned, denial of obvious facts and events you have witnessed, and frequent lies and evasions. The classic abusive partner is a narcissist. Using verbal and physical abuse to control and maintain his relationship with a partner treated as an accessory, a narcissist can spend years demeaning and abusing a partner who is locked into a co-dependence; commonly the partner has fallen into extreme dependence as the narcissist has manipulated his partner into cutting off relationships with friends and family who might help. The narcissist will at first build up a victim and treat the victim well, then devalue and abuse, and this can be cyclic—if about to actually lose their partner, they will pretend to feel remorse and behave more sensitively for just long enough to lull the victim into staying. A long-term relationship with an abusive narcissist can severely damage the victim’s self-esteem, finances, and support network, leaving him or her with few resources to recover. Be aware that some of the more attractive people you will meet are narcissists, and they are life-destroying in a long-term relationship. Run like hell if you meet one.